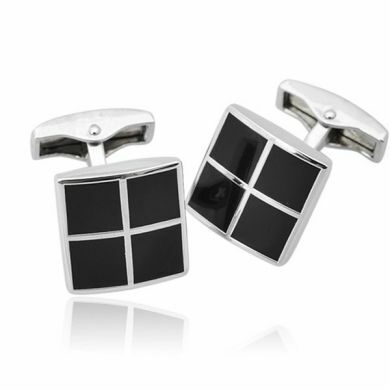 Browse through our wide selection of groomsmen gifts and see why we are so much more than cufflinks. With a variety of gifts designed to fit every budget, we've got just the thing to make your big day special for everyone. 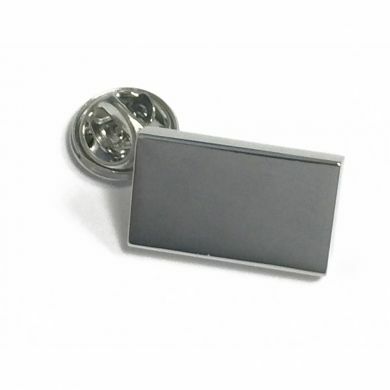 From key chains to cigar humidors, shaving kits to lapel pins, we have worked hard to ensure that all our products are of top quality and design. Be sure to check out our collection of engravable gifts as well for that personal touch. 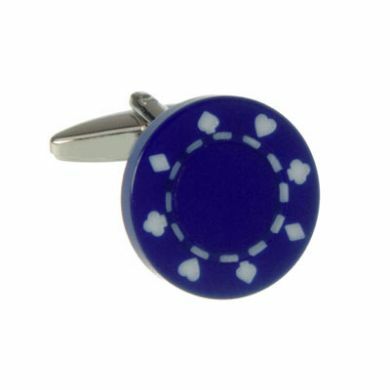 And as always, if classic is your thing, we do offer many different cuff links for the occasion - including pairs that read �Best Man" and �Usher". Your groomsmen have pledged not to let you down; now do the same for them! 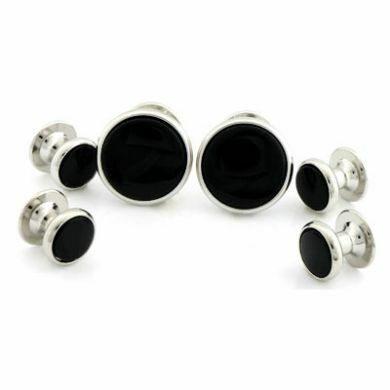 Disney Vintage Black and White Mickey Mouse Cufflinks $65.00 These fun Mickey Mouse cuff links feature a smiling vintage black and white Mickey. They have a fixed backing with his character hands on them. 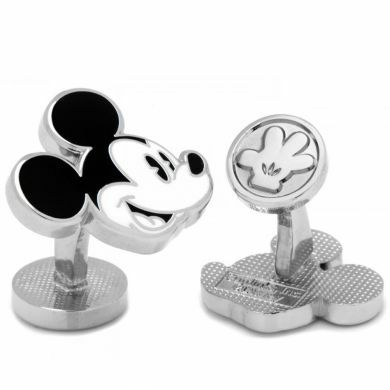 These are officially licensed and made of top quality and come with Disney logo gift box. 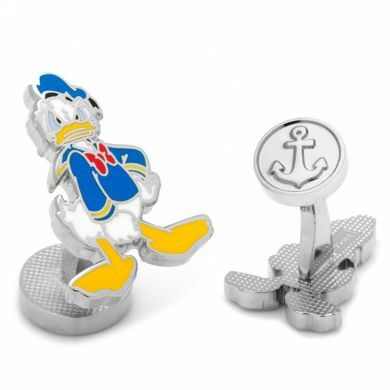 Disney Donald Duck Cufflinks $65.00 These fun Donald Duck cufflinks feature the classic Disney Character looking agitated as usual. Features a fixed back with anchor. These officially licensed Disney products come gift boxed. Star Wars Millennium Falcon Blueprint Cufflinks $65.00 "These fun Star Wars cufflinks feature the Millennium Falcon in blueprint form. 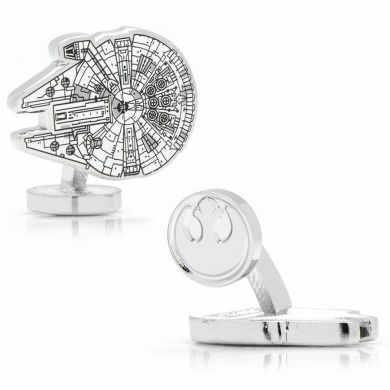 Highly detailed, these officially licensed cufflinks are made of top quality and come gift boxed with Star Wars logo. 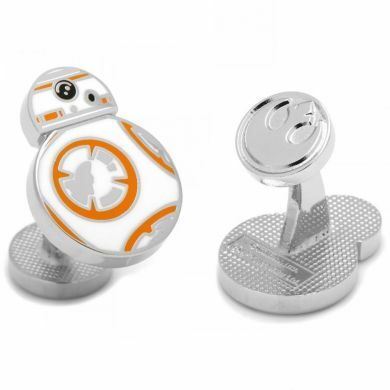 Star Wars BB-8 Cufflinks $65.00 "These fun Star Wars cufflinks feature the droid BB8 as seen in The Force Awakens movie. 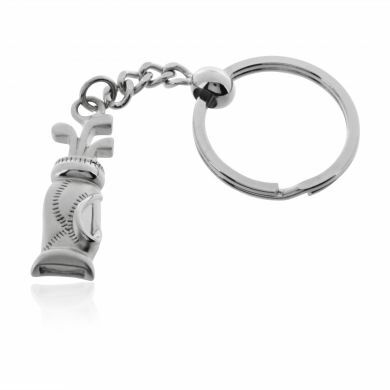 Highly detailed with silver tone and enamel inlay and come in a Star Wars logo gift box. 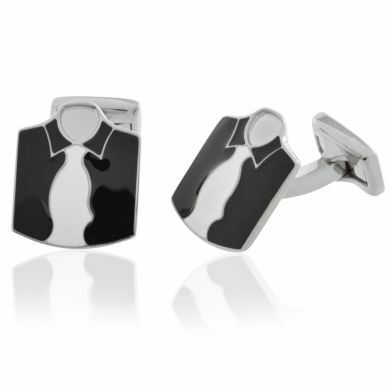 These cufflinks are officially licensed and of top quality. 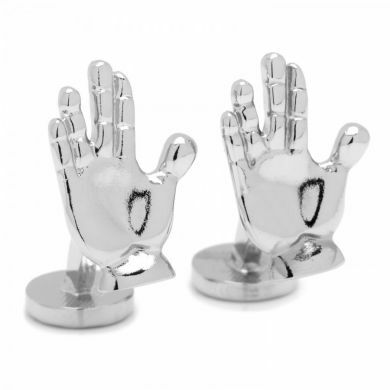 Star Trek Spock Live Long and Prosper Hand Cufflinks $65.00 These fun Star Trek cufflinks features Spock's famous hands in the Live Long and Prosper position. 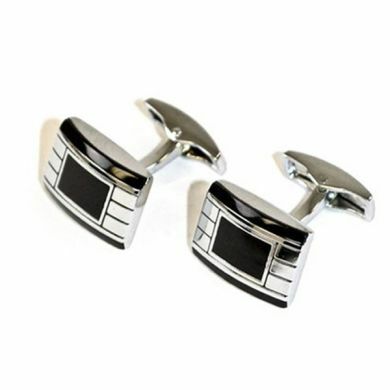 These highly detailed, officially licensed cuff links come with Star Trek logo gift box. 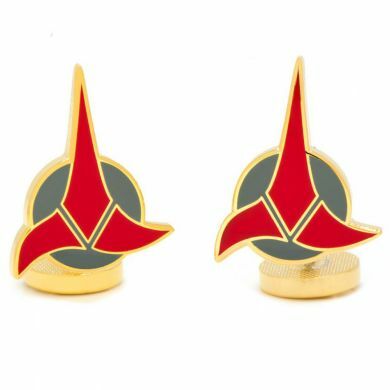 Star Trek Klingon Cufflinks $65.00 This Klingon insignia shows off your love for Star Trek. 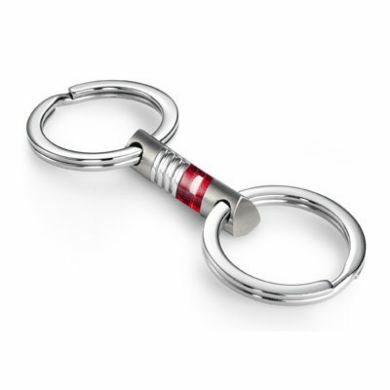 Features gold tone with red and grey enamel inlay of the best quality. Officially licensed product, with a Star Trek gift box. 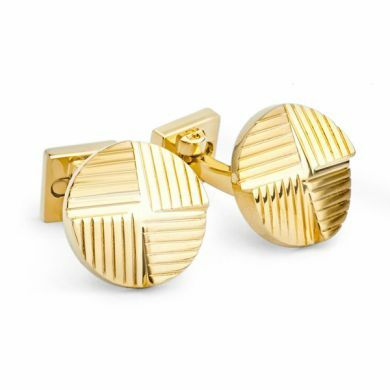 Stepped Gold Round Lined Cufflinks $100.00 $80.00 On Sale Round cufflinks do not have to be simple or boring and these Ike Behar cuff links prove that! 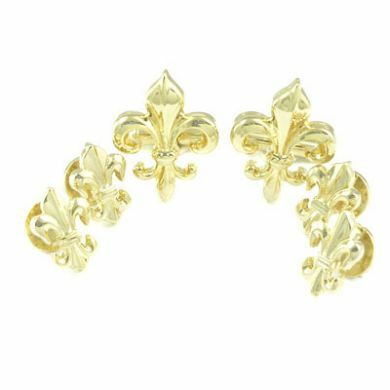 The stepped gold tone pattern is exquisitely designed and will make a great addition to any cuff. Ask about an upgraded box! 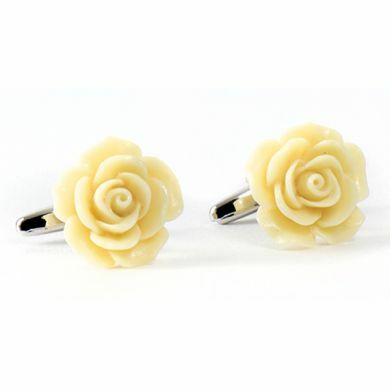 Pale Ivory Rose Cufflinks $50.00 The Rose can be a symbol of love, friendship, peace and celebration. 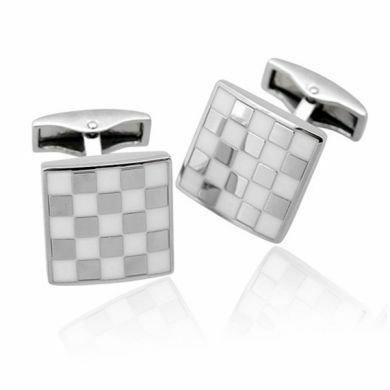 These Ivory Rose cufflinks make the perfect accessory for any wedding or special occasion. Next to the blushing bride, these will be the talk of every guest. NY Shea Stadium Seat Cufflinks $200.00 The New York Jets called Shea Stadium home from 1964 to 1983. 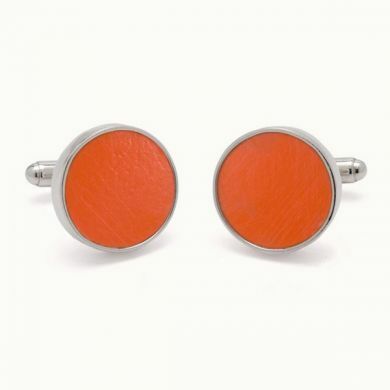 The Stadium was demolished in 2008 but you can obtain your own piece of American sports history with this limited edition pair of Shea Stadium cuff links! 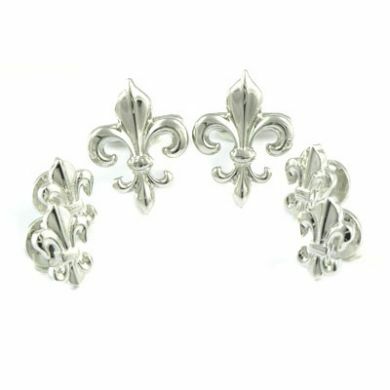 Each piece is unique, hand-crafted and encased in fine .925 sterling silver. Whether for you or a friend, any true Jets fan will appreciate the significance. 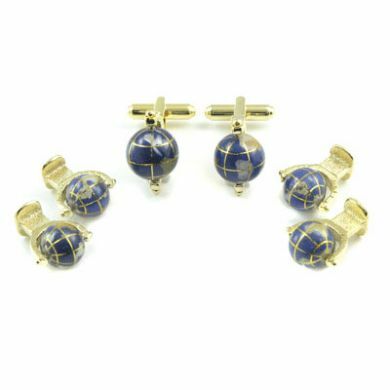 Gold and Onyx Stud Set $215.00 A 14Kt gold plated rope border design enhances genuine onyx centerpieces in this cufflink and stud set. 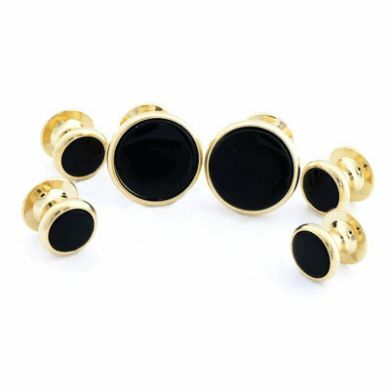 White Brass & Onyx Flat Back Stud Set $85.00 The beauty of this genuine onyx cufflink and stud set, lies in its simplicity. Set with a fixed back for a solid feel you will appreciate. 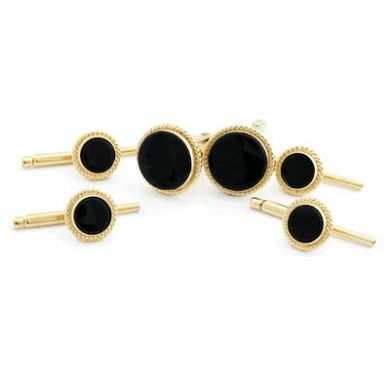 Brass & Onyx Flat Back Stud Set $85.00 The beauty of this genuine onyx cufflink and stud set, lies in its simplicity. Set with a fixed back for a solid feel you will appreciate. 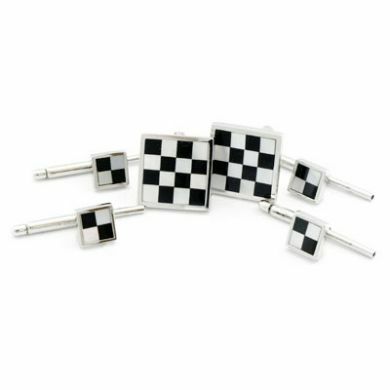 Onyx & Pearl Checkered Sterling Silver Stud Set $395.00 A checkerboard of genuine onyx and mother of pearl are hand inlaid in this sterling silver cufflink and stud set. 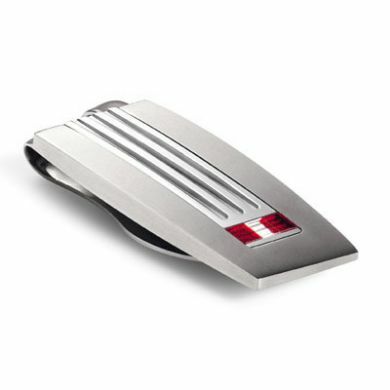 Lamborghini IL Primo Money Clip $150.00 This Lamborghini money clip makes your set complete. Makes the perfect accessory for the man who has everything. 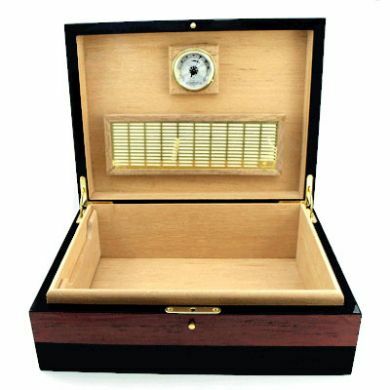 Made of the finest quality metals and comes with a beautiful box. One word should say everything, Lamborghini. Need we say more? 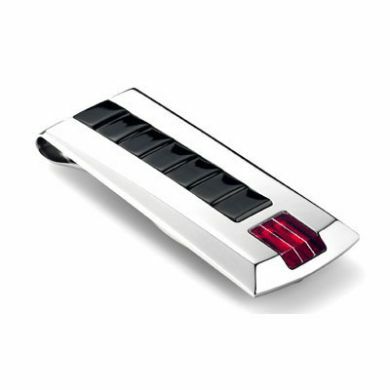 Lamborghini Corsa Money Clip $140.00 This clean looking money clip makes my mouth water. The clean lines scream sports car. The lineage is all Lamborghini. The Lamborghini money clip makes a great unique gift for that car collector in all of us. 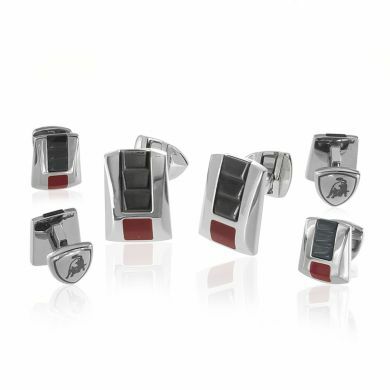 Lamborghini IL Primo Stud Set $310.00 Racy and adventurous - let your wild side come out with this glamorous Lamborghini stud set. 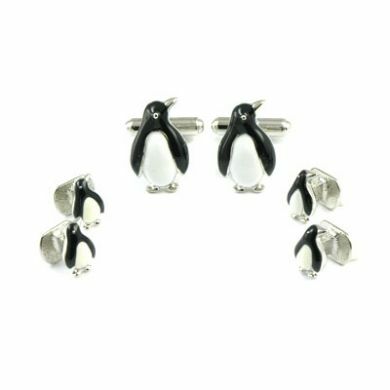 Who said cufflinks and studs are a bore? 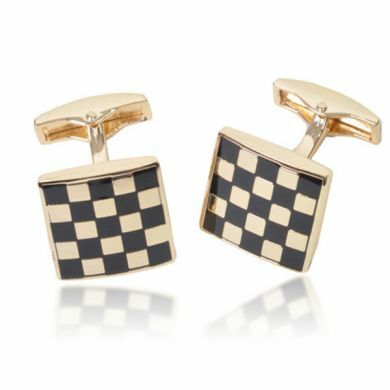 This Lamborghini studs set will liven up any attire. 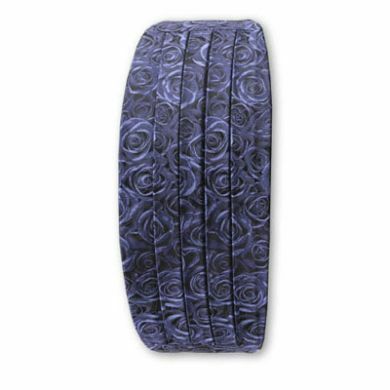 Blue Rose Cummerbund $99.00 $69.30 On Sale These handsome cummerbunds by Robert Charles are made in Italy from the finest silk and go well with matching ties (or bow ties) or cravats and cufflinks. 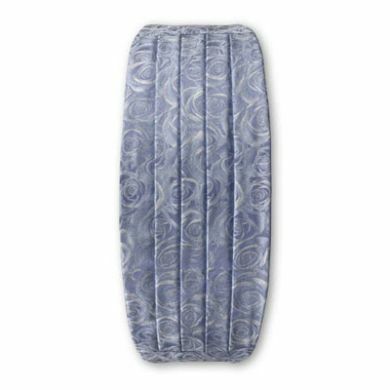 Ice Blue Rose Cummerbund $99.00 $69.30 On Sale These handsome cummerbunds by Robert Charles are made in Italy from the finest silk and go well with matching ties (or bow ties) or cravats and cufflinks. 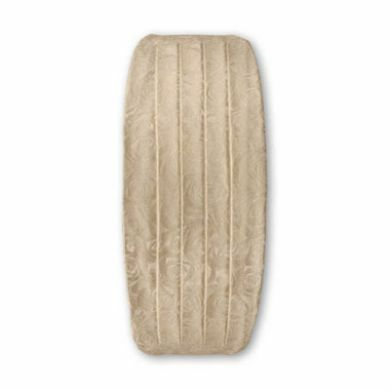 Ivory Rose Cummerbund $99.00 $69.30 On Sale These handsome cummerbunds by Robert Charles are made in Italy from the finest silk and go well with matching ties (or bow ties) or cravats and cufflinks. 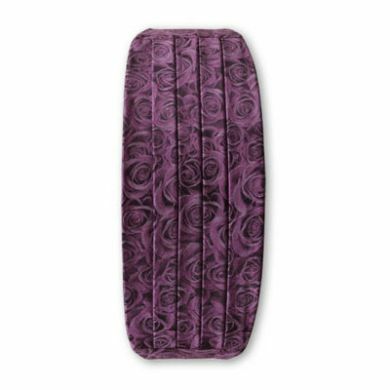 Purple Rose Cummerbund $99.00 $69.30 On Sale These handsome cummerbunds by Robert Charles are made in Italy from the finest silk and go well with matching ties (or bow ties) or cravats and cufflinks. 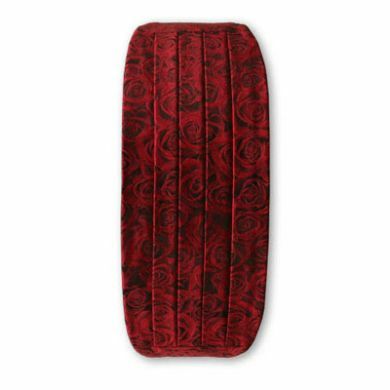 Red Rose Cummerbund $99.00 $69.30 On Sale These handsome cummerbunds by Robert Charles are made in Italy from the finest silk and go well with matching ties (or bow ties) or cravats and cufflinks.